FDR nominated the Alabama Senator as his first U.S. Supreme Court nominee. Supreme Court Justice Hugo Black. During his time on the Supreme Court, Justice Hugo Black voted to desegregate schools, expand freedom of the press and help protect housing options for minorities. He was also a former member of the Ku Klux Klan. While Black’s liberal leanings during this New Deal era, would not seem to fit with membership in the KKK, part of his motivation for joining in 1923 was political. Following years of working as a trial lawyer, Black was attempting to appeal to southern Democrats as he planned his run for the U.S. Senate from Alabama. The KKK&apos;s membership was rising. The Klan had recently undergone a resurgence, following the success of the controversial 1915 epic, The Birth of a Nation, which glorified Klan members as valiant saviors of the white South. An increase in the numbers of Jews and Catholics immigrating to the country was also triggering more interest in the Klan as some white Americans felt threatened. With their membership on the rise, Klan leaders sought to become a more visible and respected organization throughout the country. In 1925, members even went so far as to stage a parade featuring some 60,000 Klansmen in front of the White House. 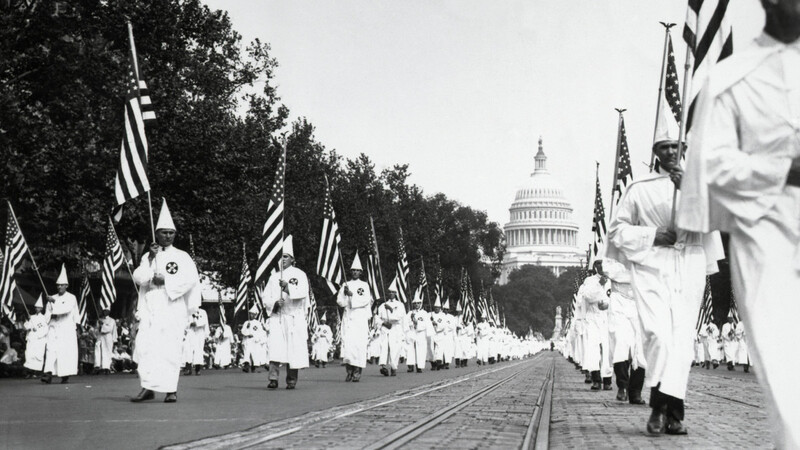 An estimated 60,000 Ku Klux Klan members marched along Pennsylvania Avenue in Washington, D.C. in 1925. “The Klan was making a play for respectability and that march down Pennsylvania Avenue and other state capitols in 1926 kind of indicated that they had done pretty good at establishing themselves,” says Tony Freyer, professor emeritus at the University of Alabama and author of Justice Hugo L. Black and the Dilemma of American Liberalism. Black calculated it was worth appealing to the growing KKK crusade. While campaigning, Black gave several anti-Catholic speeches at Klan meetings, according to Hugo Black: A Biography by Roger K. Newman. Even as the Klan’s numbers grew to more than 5 million nationwide, Black knew that he could only get so much political leverage from associating with the KKK and that public knowledge of his Klan membership could sink any chances of his winning a Senate seat. So as he readied his Senate campaign, he sent a letter of resignation to the Klan in order to officially cut ties with the organization, while still maintaining their support. Black then shifted his focus to rallying against out-of-state corporations that, he argued, siphoned money from Alabama’s working class. By setting his crosshairs on big corporations, he avoided publicly targeting minority groups. His plan worked. Black secured the democratic primary and cleared the way for an easy win against his Republican opponent in 1926. And while he had provided his letter of resignation from the Klan the year prior in 1925, his time as a member of the Klan would eventually come back to haunt him. Black supported FDR and the New Deal. As Alabama Senator, Black became an avid supporter of President Franklin D. Roosevelt and FDR’s New Deal. 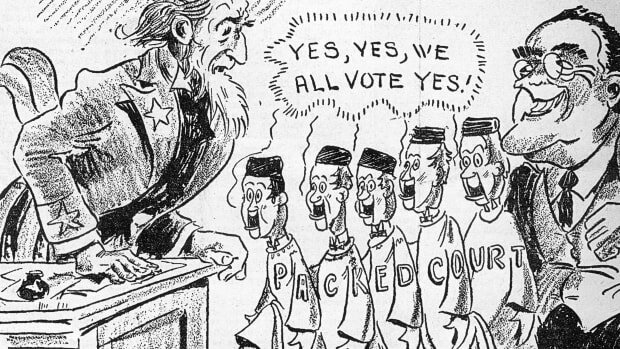 In particular, Black supported Roosevelt’s “court packing” bill, which would have increased the number of members on the Supreme Court in support of the president. 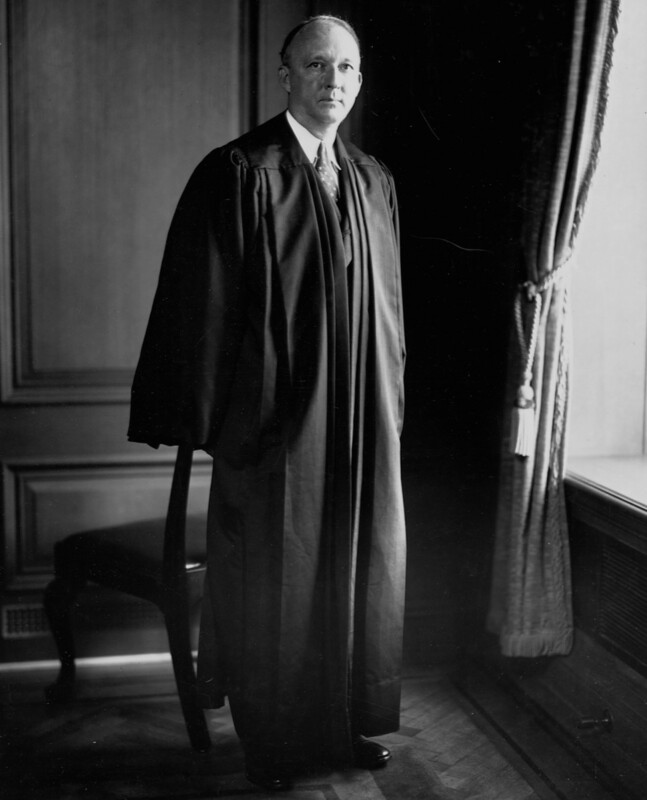 Although the bill failed to pass, Black’s consistent and public support of the president helped earn him a nomination to the Supreme Court in 1937. Since 1853, every candidate nominated for executive or judicial office was confirmed without hesitation. But the Senate took a different approach when approving their former colleague. Black was sent before the Judiciary Committee before gaining their recommendation and moving forward with a contentious confirmation hearing with the Senate. 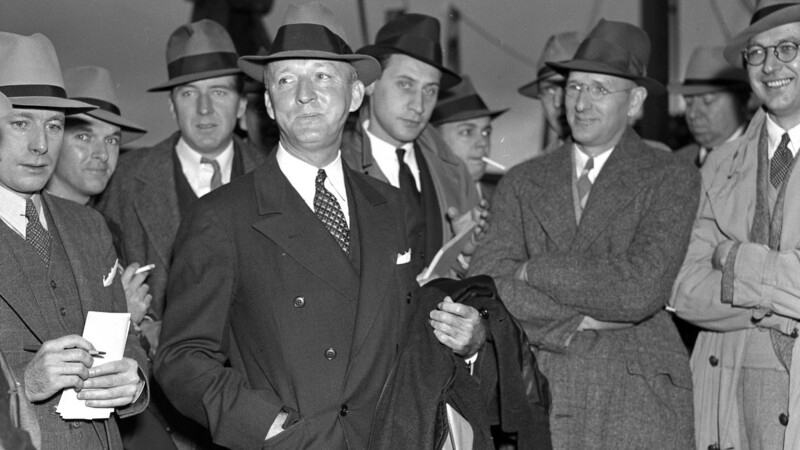 Justice Hugo Black surrounded by journalists with whom he declined to discuss his Ku Klux Klan membership. Although rumors of his allegiance to the KKK began to surface during the hearing, it was his time as a Senator that became a point of debate. 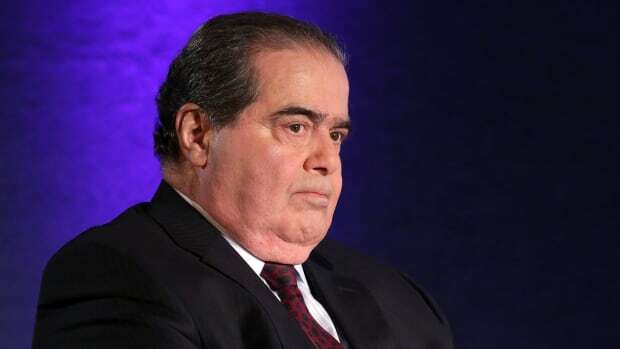 As a senator, Black voted to recognize retirement laws that would benefit those on the Supreme Court. Since Black would become a beneficiary of those new retirement perks upon his confirmation, it was argued that his appointment would present a conflict of interest. Under the Constitution&apos;s guidelines, no member of Congress would be allowed to take U.S. office if they are the beneficiary of regulations made by the same Congress. However, after six hours of debate, Black was confirmed to the Supreme Court on August 17, 1937. Black&apos;s KKK past was revealed after his confirmation. Then the other shoe dropped. Just a few weeks after getting confirmed, a report in the Pittsburgh Post-Gazette revealed Black’s history with the Klan. The Pulitzer Prize-winning report by journalist Ray Sprigle featured Black’s 1925 resignation letter from the Klan as proof. Outrage erupted. Senators who voted for his confirmation argued they would have voted differently had they known Black was a Klan member. Even Black’s strongest supporter, FDR, claimed to have had no knowledge of his KKK roots before nominating him to the highest court in the land. In response, Black addressed the public in a radio broadcast that reached some 50 million Americans. He admitted to being a former KKK member, but spoke briefly on his feelings towards minority groups. “Some of my best and most intimate friends are Catholics and Jews,” he went on to say, adding that that he had hired someone Jewish to officiate his will. And although the response was tumultuous from the press, Black’s response appeased the public enough that there were no official calls for his impeachment or resignation. 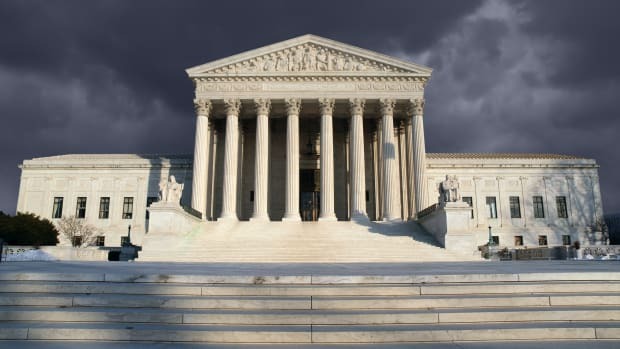 Black&apos;s Supreme Court votes leaned left—and right. As he began to rule on the bench of the Supreme Court, some of Black’s biggest critics would eventually become his greatest supporters. Placing the U.S. Constitution and the Bill of Rights above all else—he carried a copy of the Constitution in his pocket—his vote fell on both sides of the aisle, but typically leaned in favor of more liberal decisions. 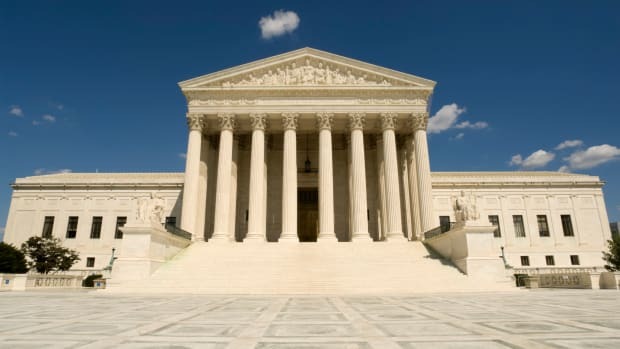 As a justice, Black voted to support the separation of church and state in Engel v. Vitale and ruled in opposition to segregation in the unanimous Brown v. Board of Education case. On the other hand, he also voted in favor of sequestering Japanese Americans in internment camps during World War II, reasoning with the majority that, in a time of war against Japan, taking “proper security measures” was justified. 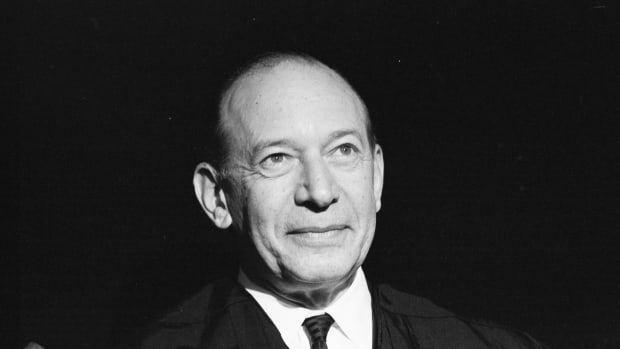 After 34 years on the bench, Black retired from the Supreme Court in 1971 and died shortly thereafter. 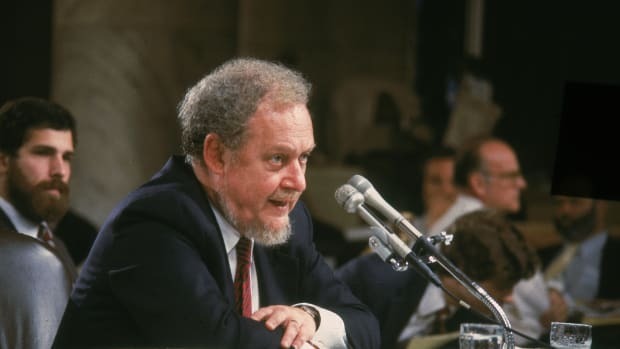 In his career, Black had both fiercely advocated for Civil Rights and the Bill of Rights and he had been a Klan member and filibustered against an anti-lynching bill in the Senate. His checkered legacy reflected not just a changed man—but a changed nation.